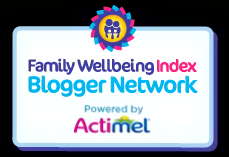 Self-proclaimed Curry queen and guest reviewer Mellow Mummy has been trying out Tilda's Wholegrain Basmati Rice to see how it compares to white Basmati. 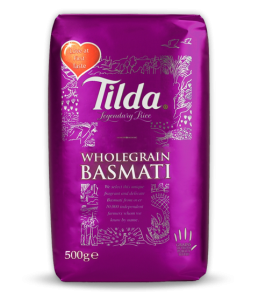 After a recent visit to my healthy and happy little sister I was inspired to try a few more wholegrain options in our family's diet so I was quite excited to find out about Tilda's Wholegrain Basmati Rice. We cook a lot of oriental and indian meals in our house so we consume a LOT of rice and usually opt for the more traditional white basmati rice which we all love (from 1 year old through to 4 year old and grown-ups). This wholegrain basmati has the outside bran layer of the rice grain still intact (usually they are rubbed off) so the rice looks browner and has a stronger flavour. 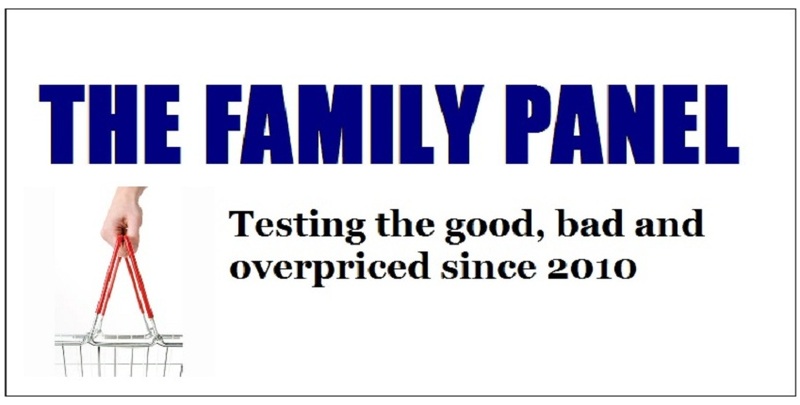 I love it - it is something totally different and I think it opens up rice for more uses in our family (although I don't think I'd choose it with most of the curries I make). Both of my girls enjoy it too as I think it is a comfortingly familiar food but with a fascinating flavour to them. My husband, on the other hand, is not that convinced because he finds the almost-nutty flavour to be too noticeable... I think he usually prefers the rice in his meal to simply be a vehicle for other flavours. Wholegrain basmati is naturally high in fibre and it has a lower GI than white basmati rice so it keeps you feeling full up for longer (hopefully stopping the temptation to snack between meals) so it is a great idea if you are looking to make healthy changes to their lifestyle. 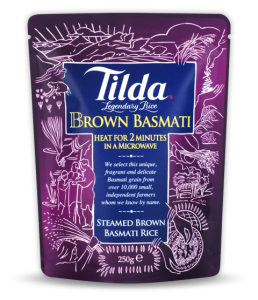 In the past I have been put off wholegrain rice because it can take a lot longer to cook than white rice but I was able to try out the handy Tilda steamed brown basmati pouches in which the rice is already pre-prepared so you can have hot wholegrain basmati rice cooked in 2 minutes. If you are struggling to think of ideas of how you would cook with wholegrain basmati rice then you can find lots of recipe ideas on the Tilda website which all look really tempting.